Fall ushers in a change of scenery for live music. Outdoor festivals wind down and local performances become less frequent. The summer definitely spoils the Columbus music scene, but that doesn’t mean the next season up isn’t packed with its fair share of local delicacies. Shows become more intimate; at times more eclectic. Outside of the Halloween madness, here are six local concerts, spanning an assortment of genres, that you should mark on your calendar this fall, including two tribute shows you’ll have to flip a coin over. Although this first event on our list takes place outside of Columbus, we still think it&apos;s well deserving of mention. All summer, adventuring company The Campfire Experience has been curating intimate, around-the-fire performances featuring a handful of popular Columbus performers. With the last Campfire Sessions slated for mid-October to feature The Cordial Sins, the 45-minute trek south and $20 ticket are more than reasonable for this unique musical experience. Pack a picnic, enjoy some s’mores, down a Rockmill farmhouse ale and let The Cordial Sins’ inventive shoegaze complete the relaxing evening. Who called for that pre-Halloween funk? Three of Columbus’ grooviest groups will be joining forces at Brother’s Drake to lift your spirits up a week before the monsters come out. The Deeptones will be sure to fill the stage with both their bodies and intense funk, Capital University project Funk Worthy will ignite the dance floor underneath you and Booty&theKidd will take you to the most cavernous depths of blended musical genres. Progressive funk rockers Chirp from Michigan will also be joining the $5 show. Time: 8 p.m. Date: Friday, Oct. 19 Address: 26 E. 5th Ave.
A local musician who’s extremely deliberate when releasing music and performing live, singer-songwriter T.Wong’s music has the ability to transport its listeners through a myriad of emotions. As the imaginative spectrum of R&B continues to expand, T.Wong immaculately reflected that on his sophomore album “The Upside Down.” “7sins” leads you to Frank Ocean-level musings, while “LionvDragon” has some darker contemplations. Tickets start at $10, be sure to get yours and find out what all the hype is about. 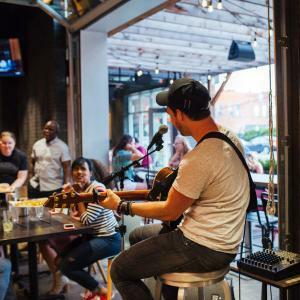 A brief step away from your traditional local concert experience isn’t always a bad thing, especially when we’re talking about walking into one of the hottest Mexican restaurants in town. 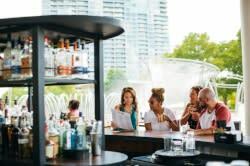 On top of serving delectable traditional and modern Mexican meals, Italian Village spot Cosecha Cocina is also the place to be at every Monday for free, live and local music. Bringing out some of the city’s best songwriters—such as Paisha Thomas, Dave Buker and Joey Hebdo—Cosecha will follow suit with Honey and Blue in November. This group&apos;s soulful blues combined with meditations on love will guide you through one of the more pleasant dinner dates you’ve had in recent memory. Time: 7 p.m. Date: Monday, Nov. 5 Address: 987 N. 4th St.
Named after The Band’s epic farewell concert, the Columbus treatment of The Last Waltz is turning half a decade old this November. Much like The Band&apos;s collaborations with the likes of Bob Dylan and Muddy Waters, some of the capital city’s finest musicians will come together for one night to replicate that grand 1976 Thanksgiving day performance. James Wooster will once again lead a band composed of Wib Shneider, Ryan Paradise, David Freeman, Michael Brokamp and Benny Coleman. Time: 7:30 p.m. Date: Friday, Nov. 16 Address: 1722 N. High St. The beginning of November also guarantees one more thing: Columbus’ annual Jimi Hendrix tribute night. Marking the month that the legendary musician was born, this tribute stands as one of the city’s finest musical homages. This year’s version will feature Jeffro Jam, Dr. Kenny Delicious, Nathan Smith, Maxwell Button, Theo Perry, Doug Neel and Ryan Joseph Jones. Join them in celebrating the life and catalog of one of rock’s finest instrumentalists. Entry is $10, and under 21 pays an additional $2 at the door. Time: Doors 8 p.m. Date: Friday, Nov. 16 Address: 2507 Summit St.